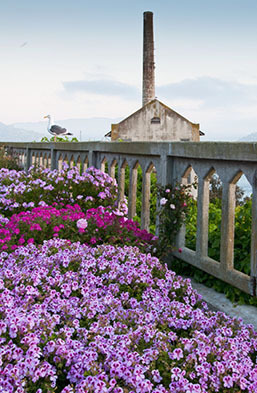 Other than fog drip and winter rains, Alcatraz Island is without a source of fresh water. Historically, both the military and the federal prison had built cisterns to capture rainwater, but these fell into disrepair after the prison closed. Because the National Park Service is dependent on water brought by barge to the island, the Gardens of Alcatraz project team installed a rainwater catchment system in 2009. By using the historic concrete cisterns that recycled water from the former federal prison showers, the system can capture 12,000 gallons of rainwater, meeting the garden's annual water needs. » Click here to read more. 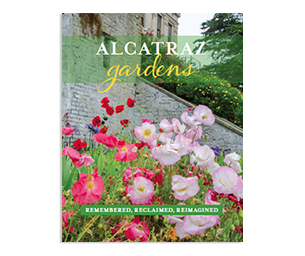 When the Gardens of Alcatraz restoration project began in 2003, staff and volunteers began removing 40 years of overgrowth without a designated place on the island to compost. The removed overgrowth was hauled to the Parade Ground and added to the ruins of the former apartment buildings, already buried in vegetation. But the Parade Ground closes each bird-nesting season from February to September, so every winter there was a race to clear and deposit the vegetation; during the summer months vegetation removal still continued but a massive pile accumulated quickly, waiting to be hauled away in September. » Click here to read more.